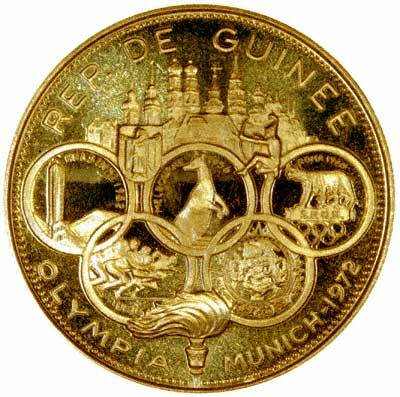 Guinea has had only two presidents since gaining its independence from France in 1958. Lansana CONTE came to power in 1984 when the military seized the government after the death of the first president, Sekou TOURE. Guinea did not hold democratic elections until 1993 when Gen. CONTE (head of the military government) was elected president of the civilian government. He was reelected in 1998 and again in 2003. Unrest in Sierra Leone and Liberia has spilled over into Guinea on several occasions over the past decade, threatening stability and creating humanitarian emergencies. In 2006, declining economic conditions prompted two massive strikes that sparked urban unrest in many Guinean cities. 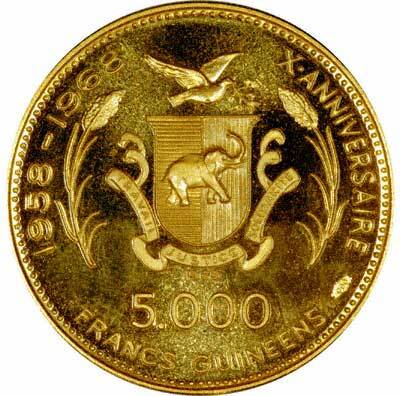 Guinea issued an impressive proof set of four gold and four silver coins in 1969 and 1970 for the 10th anniversary of its independence in 1968. Each coin has its own different design, which adds to the attraction of the set. It is a rare set which we only see very infrequently. Coat of Arms, elephant in quartered shield with dove of peace flying above. There is a stalk of sorgum on either side of the shield. A ribbon or scroll on three sides of the shield carries the inscribed motto "TRAVAIL JUSTICE SOLIDARITE"
The small date is just below the ribbon, and above the mark of value "10,000" for example. According to some sources the coat of arms from 12th October 1968 to 1972, and then from 1979 onwards, was a silk-cotton tree on a gray shield, with 6 stars above, and the motto "UNIDAD - PAZ - JUSTICIA" on a scroll below. As can be seen from our coins, the coat-of-arms was actually different at the time. The box is leather covering on wood, with fitted velvet inside, and a piece of leopard skin attached to the outer lid. On our set, and possibly on all sets, there are distinct lines visible on most coins, which look at first glance like scratches, but which on closer inspection to be irregularities either in the dies, or more probably in the blanks (planchets).